Green Bay Packers tickets are one of the most sought after in all of sports. We can provide YOU with a Green Bay Packers ticket to all home or road games. Green Bay has a great tradition of tailgate parties. 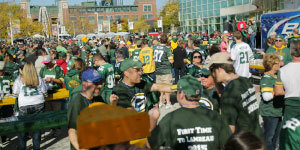 Join hundreds of fellow Packers fans as we PARTY in then "shadows" of historic Lambeau Field! Add a hotel package to your trip to get the full fan experience of a Packers home game, and spending time with the #1 football fans in the USA. Live it up at a Green Bay Packers game without the headaches of driving. 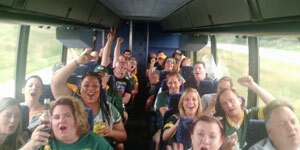 Green Bay Ticket Service offers roundtrip bus transportation with GAME TICKETS and BUS ONLY options to every regular season home game. If you need Green Bay Packers tickets, you’ve come to the right place. At Green Bay Ticket Service, our ONLY business is selling Packers tickets. To complement your Packers game experience, we also sell hotel rooms within walking distance of Lambeau Field, a Wisconsin-style tailgate party and parking passes. We offer everything you need to attend a Packers game at historic Lambeau Field. The BEST part for our customers is that unlike our major competitors we charge NO service fees. That means you save BIG money by paying competitive prices on tickets and reducing service fees by up to 20%. 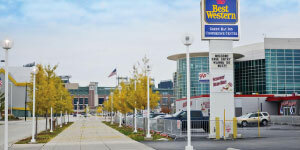 Our office is located one mile from Lambeau Field. We offer on-site day of game services including free ticket pickup and an experienced sales staff available to answer questions and serve your needs until game time. Because we’re local we know the stadium and what the view is like from each seat. If you need something special let us know and we’ll do our best to accommodate your needs. We also offer much larger group blocks of tickets than most other ticket brokers. You can buy your tickets online or by phone. All major credit cards are accepted and we provide a money back guarantee if you do not receive the product or service you ordered. We’ve been serving Green Bay Packers fans since 1986 and have never defaulted on a ticket order. Looking to sell your Green Bay Packer tickets? We’ll buy them. 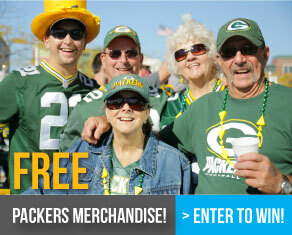 Looking for tickets to a Green Bay Packers away game? We sell those too! When you purchase our products, you will experience a football game in the most unique atmosphere and smallest city in the NFL. You will attend a Green Bay Packers game at historic Lambeau Field, rated the number one fan experience in the country by ESPN the Magazine. The Green Bay Packers are 14-time World Champions led by 2-time MVP Quarterback Aaron Rodgers. You will experience an authentic Wisconsin-style tailgate party before the game and enjoy the camaraderie of hundreds of fellow Packers fans. In Green Bay, football isn’t just a game – it’s a way of life! Our goal is to make sure that everyone who buys a Packers ticket from us has the experience of a lifetime! Call us today at: 866-449-7225 or buy online. * Start time and broadcast may shift due to NFL flexible schedule. We had a GREAT time. All of the people were so kind...just as we remembered Packers fans and present/former Wisconsin people to be. We wanted to thank you for such a wonderful time. We had so much fun! Can't wait till next year. Just want to thank you for all the help you have given us through the past 12 years! Let me extend my most sincere thanks and appreciation for the wonderful plans and arrangements you all did to make the Super Bowl experience a lifetime memory. Thanks for your help getting tickets to the Super Bowl. Everything worked out well. We had a great time. What a Packer victory. I would recommend Titletown to other people. Thank you for your service, I received my tickets today. I cannot say how happy I am for your company, you guys saved me a ton of money. Thanks again. I just wanted to take a minute and tell you how nice it was to finally meet you. Also I wanted to thank you for all the past service and help that you have provided for me, and I look forward to many more years of fun at Lambeau!! You folks are terrific. Thany you both once again for your help. I'm super excited and trying not to show it too much while at work!! "...We would like to thank you and the players for a dream come true." "...Thank you 4 the prompt and very professional way in which you handled our order. THE PACK will always have great fans with good people like you handling their orders." "Thank you for making my first trip to Green Bay a memorable one, the Saturday before the game was by far one of the best day of our lives"
"Titletown Tickets is our ticket company of choice; I appreciate the fact you didn't charge me any service fees just for doing business with you ....... like other companies I called." "We enjoyed being with everyone, especially the Packers Cruise group and our football friends. The courtesies and hospitality extended were appreciated. Cherry joins me in sending our best wishes to you." "You really made our visit more memorable with your kindness." "When I received the package I was so excited...even the envelope smelled nice. I had a great weekend away.......I am glad I made the right decision on where to buy my dream tickets!!!!" "The Tailgate party was the best we ever attended, the food was hot and fresh and the camaraderie was excellent." "Thanks again for the really great cruise we had a really nice time, hope to do it again soon." "I really appreciate having a private area and seating at the AWESOME tailgate party. We had a great time, and it got us pumped up for the game plus it saved us a fortune on beer and food!" "What a delightful weekend. All was as advertised - even better than expected. Thanks for the memories!" "I just got back from a great weekend and it was beyond my imagination. This will be an annual trip and we thank you guys for all of your help"
"Titletown Tickets and Tours generosity to Community Hospice Foundation was wonderful; a gift to someone who will need the services of Hospice is so important and needed. Thank you so much for inviting the Foundation to benefit from your generosity"
"From the time we parked until we left the game everything went smoothly. There are some great people working for you, keep up the great work!" "What a steal, you have the best deals in town and from here on out I will only buy my tickets from Titletown Tickets and Tours!" "I just wanted to say thank you for the tremendous service. 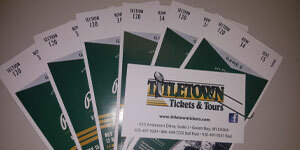 The team at Titletown Tickets is awesome! Whether it is a first rate place for a meal and a beer or tickets and lodging for games...I refer all Packer fans to you guys. Go Pack!" "We had an amazing experience, everything was in walking distance and the Tailgate party was fantastic. It was fun to be that close to the stadium with all of those Packer fans and the free food and beer was a huge plus. Thanks again between your great prices and the fantastic time we will definitely see you in the future." We provide a money back guarantee if you do not receive the product or service ordered. In our 30 year history, we’ve never defaulted on an order! Save up to 20% on service fees charged by other ticket brokers. | Designed by Musial Marketing.